Other than double eyelid surgery, canthoplasty is one of the most popular procedures to create pretty eyes just like K-pop stars. It is the procedure to make your eyes bigger and more vivid-looking by cutting the palpebral fissure, either inner or outer or both, corner of the eyes in order to lengthen the eyes. Canthoplasty itself is divided into two categories, epicanthoplasty and lateral canthoplasty. Epicanthoplasty, also known as ‘Magic Epicanthoplasty’, helps shape the inner corner part of the eyes whereas Lateral canthoplasty helps shape the outer corner part of the eyes. General price guide line for Epicanthoplasty is USD$750 to USD$1,100 according to Korea Health Industry Development Institute. The price is decided depending on the method and difficulty of patients’ case. In case of other procedures are added with canthoplasty surgery, the price is on the top of canthoplasty price. Epicanthoplasty is the surgery that reshapes the inner corner of eyes to lengthen the eyes by removing the epicanthal folds also known as Mongolian folds. ‘Mongolian fold’ usually appears more commonly in Asian ethnicities. Usually, the eyes with Mongolian folds give a stuffy impression. However, increasing the length of the eyes makes the eyes look wider, clearer, and bigger as well as gives a much softer and kinder impression. 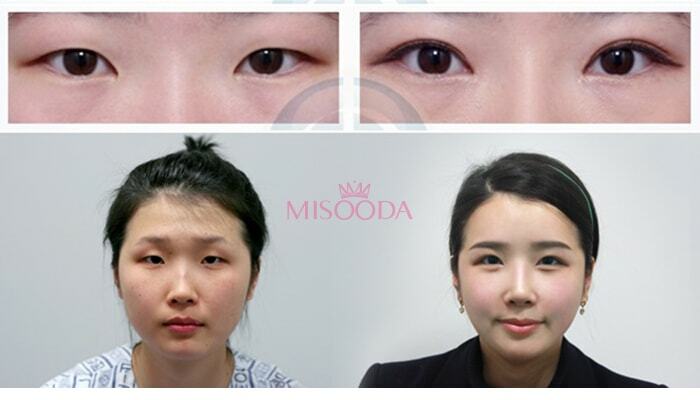 It optimizes the surgical result of the eyelid surgery when performed with double eyelid surgery. Such procedures need to be done by an experienced doctor who has very delicate skills because the inner eyelid is a very sensitive surgical area and may leave visible scars. Who are the candidates for Epicanthoplasty surgery? What is Lateral Epicanthoplasty surgery? Lateral epicanthoplasty is the surgery that reshapes the outer or lateral corner of eyes to lengthen the eyes and make the eyes appear bigger and longer horizontally by reshaping lateral epicanthus. This procedure not only elongates the eyes but also corrects any malpositioning of the outer corners of eyes. It is the most suitable surgery for those who have fierce-looking impression due to cat-like eyes or slanted eyes because it gives much softer and nicer impression by lowering down the outer corner of eyes. However, there’s a risk of conjunctiva exposure when there is excessive cutting of palpebral fissure and a chance of rejoining. Who are the candidates for Lateral Epicanthoplasty surgery?